I built a car. It turned out to be an alien robot. 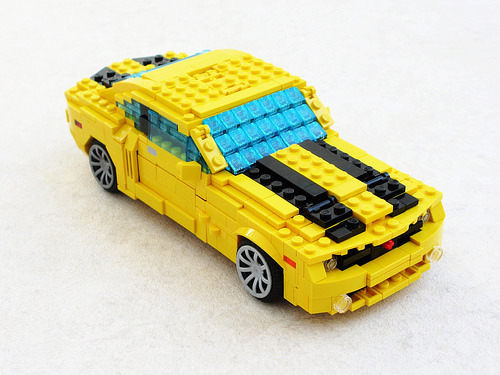 Lugnuts, the online club for LEGO car enthusiasts, is currently running its 83rd build challenge, called Only in America. It’s all about cars from the USA. I decided I was going to build a typical American muscle car as my entry: a Chevrolet Camaro. Some of you may think that there is nothing particularly special about it. It looks pretty much like all of the other cars I build: it has studs on top, brick-built windows that are pretty much opaque and, while some bits of it are built sideways, the construction does not look particularly complicated. I suppose that superficially it’s a bit old-school really. If you are a fan of Transformers you may have realised that it is in fact the Transformer Bumblebee, from one of the Michael Bay live-action films, in car mode. It serves as the latest addition to my ever-growing collection of vehicles from films and TV series. However, you may not realise that there is more to it than meets the eye. I wasn’t going to settle for things such as an opening hood and trunk. If I was going to build a Transformer, it would have to be able to transform. The main difficulty when building a Transformer is, of course, making it look good both as a robot and as a vehicle, whilst keeping it sturdy enough to manipulate it during the transformation. Modern-day Transformers are far more complicated than the toys that accompanied the original animated series from the eighties, which adds to the challenge. Fortunately, Bumblebee is not the most complicated of the lot. 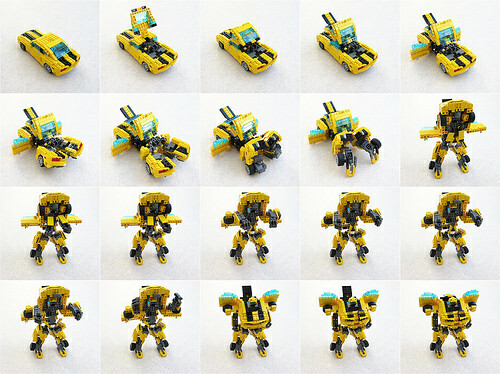 I based the transformation sequence on that of Bumblebee toys, with only a few modifications required to make it work in LEGO. I built a car, it turned out to be an alien robot. Who knew? That is amazing. I’m viewing this on my phone but can’t wait to get home to take a closer look at the images enlarged! Have you thought about submitting to LEGO Ideas? Thanks for the comments. Unfortunately it is quite fragile, which makes playing around with it an exercise in frustration. That is also one reason why I suspect it wouldn’t make much sense for Lego Ideas. I think I’d have to simplify it a lot. Furthermore, Hasbro, which owns the Transformers license already does Kreo Transformers. They don’t actually transform, but that’s besides the point. It’s a no-go. Ah yea. :( Completely forgot about Hasbro’s Kreo Transformers. Shame it’s so fragile. But still looks awesome! 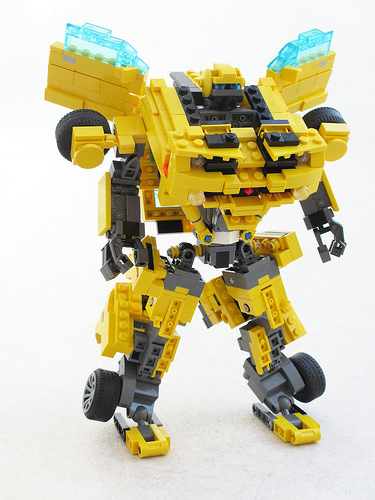 for lego ideas, i don’t thing fragility is a big problem, considering the original exo-suit was extremely fragile, and about license, you can try the way that every third party transformers company always use until now. give it a different name and backstory, so when suing comes, you can just say it’s a homage. on that video, you can see clearly that it’s dinobot sludge, but by giving it name columpio, they can get away just fine.